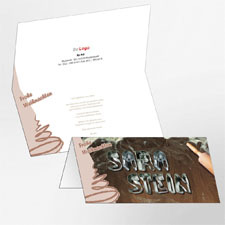 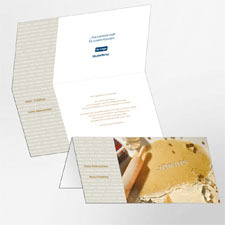 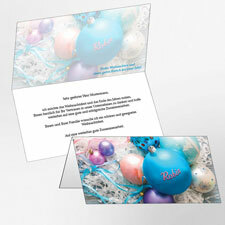 A particularly striking form of promotion at the end of the year is the personalised Christmas card. 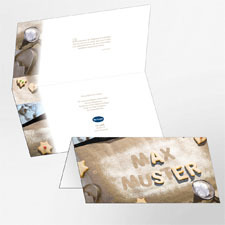 In contrast to the classic variant, image personalisation ensures the card is truly eye-catching and remains in the memory of the recipient for longer. We print an individually personalised Christmas card for each of your recipients; for example one hundred different Christmas cards for one hundred different recipients, bearing one hundred different names. 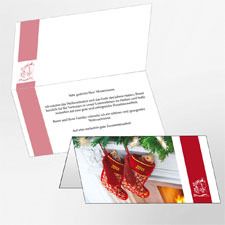 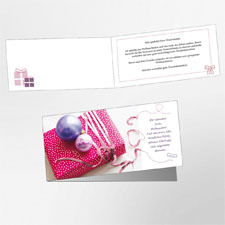 The cards are naturally also printed with your logo and the desired text..
For most companies, sending Christmas cards on the occasion of the most important festival of the year is just as much a custom as the Christmas tree and roast turkey. 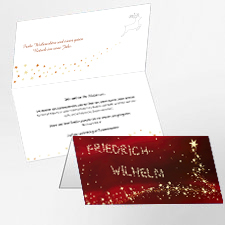 Ultimately, it is a good opportunity to thank customers and commercial partners for successful cooperation. 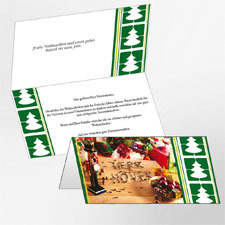 However, this tradition also means that most of the Christmas post arrives at the same time and the majority of cards look pretty much alike. 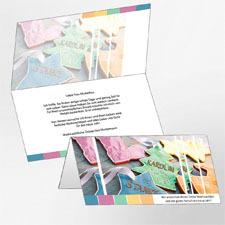 Anyone who wishes to stand out from the rest opts for individuality, original Christmas designs and personalised Christmas cards. 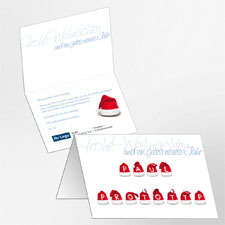 Thanks to modern workflows and mass customisation we are able to offer you the utmost in individuality in conjunction with attractive prices. 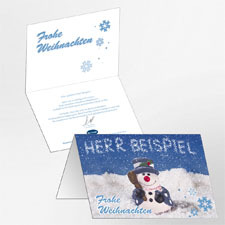 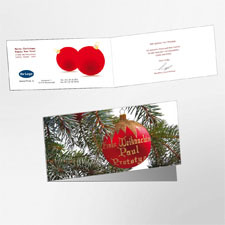 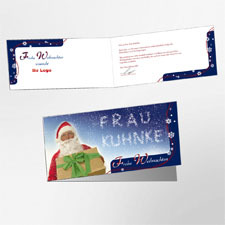 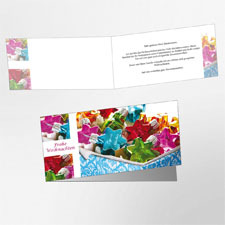 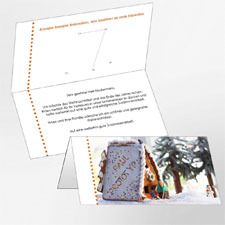 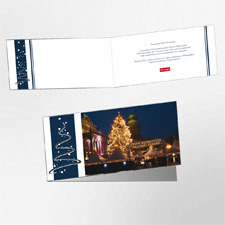 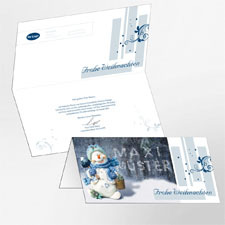 You wish to send Christmas greeting cards with personalised images to your friends or commercial partners? 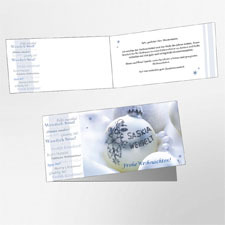 No problem, even if there's not much time - because you don't need to design anything. 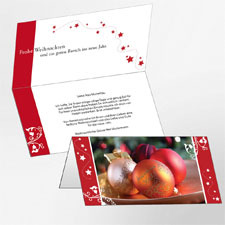 We have already prepared a wide range of layouts and we deliver your personalised Christmas cards done and dusted as a package ex words, or post your Christmas cards directly to your customers on request. 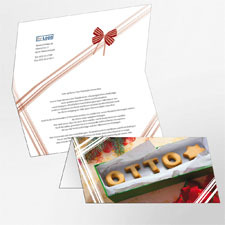 When placing your order please provide us with an individual greeting text, if required your logo and an Excel file containing the names and addresses of the recipients. 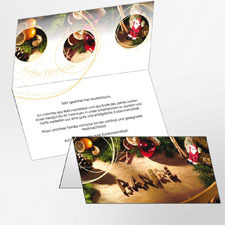 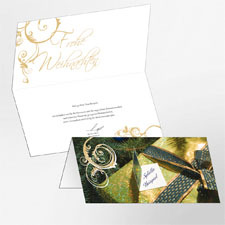 Our graphics department will naturally also be happy to cater for your special wishes and adapt personalised Christmas cards to your Corporate Design. 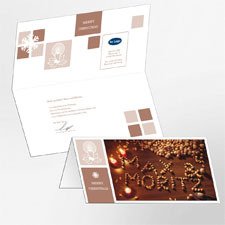 If you require this, please request your individual and non-binding quotation, ideally today – because the year passes quicker than one expects!